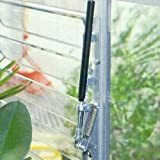 Home Improvement Store > Products > Building Supplies > Building Materials > Premium Magnetic Screen Door – Instant Bug Mesh – White. New Design, No Gaps, Velcro Sewn Into Seam; 36″, Hands Free; Dont Rely on As Seen on Tv Magic Mesh, Bug Off, Magna, Mosquito Fly Curtain Closures; DIY, Let Fresh Air and Pets In, Keep Bugs Out! 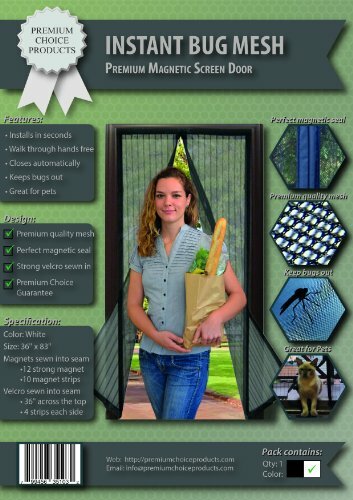 Premium Magnetic Screen Door - Instant Bug Mesh - White. New Design, No Gaps, Velcro Sewn Into Seam; 36", Hands Free; Dont Rely on As Seen on Tv Magic Mesh, Bug Off, Magna, Mosquito Fly Curtain Closures; DIY, Let Fresh Air and Pets In, Keep Bugs Out! See and feel the difference of the high quality polyester used in Instant Bug Mesh, a stronger more durable mesh which feels soft, is machine washable and keeps more bugs out. Competing mesh products generally use lightweight polyester with seams that are heat sealed rather than sewn, to save on manufacturing costs. Using a combination of long magnet strips and strong magnet blocks, Instant Bug Mesh magnets are sewn into the seam providing a perfect seal from top to bottom. Magnets from competing mesh products are fastened in plastic clips leaving gaps where bugs will sneak in. With regular use the plastic clips can come loose and fall off. Instant Bug Mesh has a full length Velcro strip sewn into the mesh across the top and four 4inch Velcro strips sewn down each side. Additionally you can use the provide push pins for an installation strong enough to handle years heavy household traffic. Competing mesh products ship with pieces of double sided sticky tape which is expected to stick to both the mesh and the door frame and simply will not last with regular use. 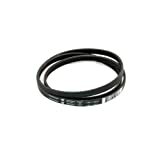 Instant Bug Mesh comes with a full 12 month replacement guarantee for manufacturing faults! - Selling fast, so be quick! 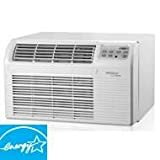 Click the Add To Cart button now and let the fresh breeze in!